« 365- Times gone by…. 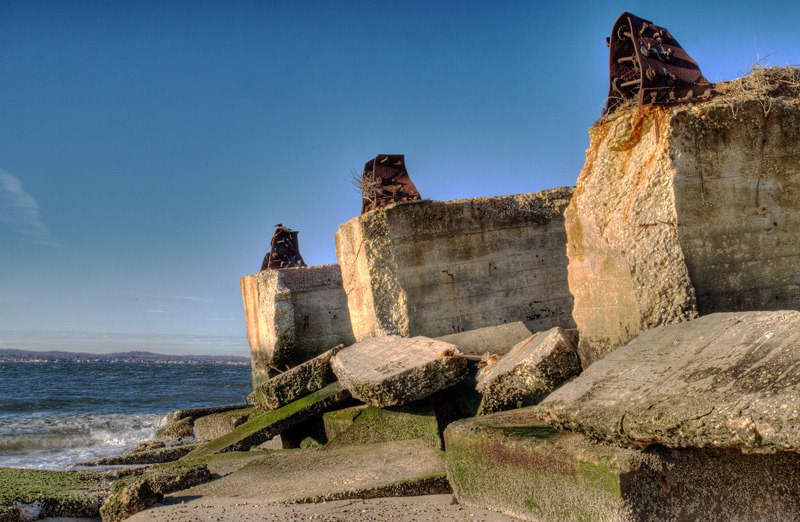 Sandy Hook, NJ is the home of Fort Hancock, a miltary outpost in the early 1900’s. Although mostly abandoned, it is also the home of the Sandy Hook lighthouse, the oldest lighthouse in the US, which was built in 1764. This picture was taken about a 1/2 of a mile from there and although they are both built with concrete or cement, this unknown structure has not faired as well as the lighthouse, which still stands today. This entry was posted on January 4, 2009 at 11:42 pm and is filed under Photos with tags Concrete or Cement,. You can follow any responses to this entry through the RSS 2.0 feed. You can leave a response, or trackback from your own site. Love the structures, makes for one beautiful image – nice job! Great shot, never been there, but love lighthouses. Beautiful day too. The colors in this picture are beautiful, Mike. I especially like the sky. Great shot! I can even see the water lines (I guess that’s what they are ??) on the bases. I really like this one! Striking photograph! So glad the weather participated for today’s shot! Beautiful shot. Thanks for explaining the history of it. It’s fabulous! I love your interpretation! Nice shot! The light was just right to keep all the concrete from looking cold and washed out. This is great, I like the light and the rhythm of remnants. Those are some huge chunks of concrete. I love the repetition of the three structures and the “white space” around filled by blue sky. Great composition on this one. I like it! Interesting shot – like the repeating of those stones at the top against the sky!